Sometimes it takes more plays to capture a stone or chain of stones than its number of adjacent empty points. There can be problems of access to the liberties. That's to say: a chain isn't always such that you can put it in atari by the direct method of filling in liberties one by one. Preliminary approach moves may be required. How many liberties does this shape have left? There are 13 liberties (primary sense) marked with circles. But Black will need an approach play at one of a and b to put White into atari successfully without losing two stones. Therefore White's chain has one more (secondary) liberty than meets the eye. Often therefore an approach move is counted in as a 'liberty' in the second sense. 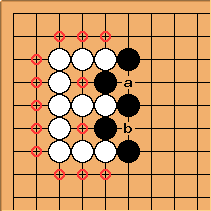 The other typical reason is that filling liberties inside, as shown for example on the attrition method page, requires repeated plays under the stones, that is, on points that become vacant when the opponent captures. Some further elementary secondary liberties examples. Here White can win the capturing race with , because the white group on the edge has a secondary liberty. It has one secondary liberty: Black to play can win by taking off or . So to count correctly one can count a as two liberties for White, and b as one. Or the other way round. Not both. BobMcGuigan: The Japanese often use the character "te", or "move" in semeai situations. For example "Black wins by two moves". This incorporates the "secondary liberty" idea and refers to the most efficient attempt to capture, and avoids the problem of considering something like a required capture of a stone as a "liberty". However, I note that when my friends and I are informally discussing these situations during a game review we usually just use the word "liberty", without distinguishing primary from secondary. Charles In examples of 'secondary' liberties caused by shortage of liberties, there can be some quite complex effects: in order to play an approach move on some black stones, White may have to take some other black stones off the board. That might even itself involve winning a complicated ko ... For myself I therefore don't see a future for a rigorous concept of secondary liberty. It is true that from a teaching point of view, in relation to capturing races, learning to count two liberties in a place where there is just one 'physical' liberty can be a good habit to learn. But it seems a mistake to push that concept by giving it a higher status. Bill: This is just a case of the ambiguity of language. It is not necessary, but that's just how it is. The two counts coincide if a group has no liberties, and that is what defines capture, so we really could do without the dame count meaning, and just use the moves to capture meaning. On the other hand, the dame count meaning is apparent to the eye. Page truncated 2003/06/09 by Charles Matthews (who has now tried to write up secondary liberty better), to get a short, readable discussion here - look back to version 15 for older discussion here.